I wanted an easy way to play audio-samples on stage when I'm playing concerts with my band. The basic idea is to make a stompbox with SPDT/DPDT-buttons that will trigger the audio-samples to be played from an SD-card. 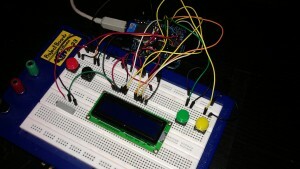 I had an 16x2 LCD-display laying around, so I thought I'd use it for visual feedback ie. what sample is playing, which one is next, current status of the sampler etc. The circuit is currently on a breadboard, so I'll update this section when the prototyping is finished. awesome! can’t wait to see it. Any progress on this? I’m looking for a simple sampler to put into a small enclosure, for similar use.